Sobetter tv antennas provide the maximum content available in your area antennas capable of receiving both VHF and UHF signal from up to 35 miles away. Sobetter HDTV indoor antennas advise you to cut the cable and get access to HD programs forever including local news, weather forecast and sitcoms,kids and sports programs,etc.Enjoy crystal clear HDTV shows,720p,1080i,1080p|ATSC available. 1, Check to make sure you have correctly connected the digital TV antenna to your HDTV or third-party HD receiver. 2, Re-scan for channels: In the TV's setup menu, set the mode to indoor TV antenna or air. Refer to the TV manual for detailed instructions. 3, Reposition the indoor TV antenna in a different location. It is suggested place it higher on a wall or closer to a window. Sometimes moving a few feet can make a difference. 4, keep the TV antenna away from those big power consumption devices interference, such as air conditioner, refrigerator and microwave oven,etc. 5, This is an without amplified HDTV antenna. If a signal cannot be received You can also purchase our up to 50miles amplifier HDTV Antenna. 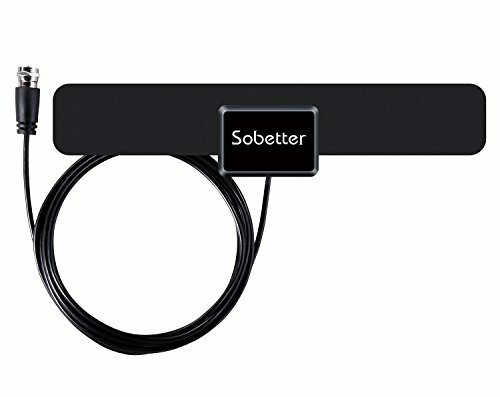 Sobetter TOP INDOOR TV ANTENNA: Are you still pay for the cable or satellite fee for televison? Come on! Our indoor TV antenna is a receiver that can get all of your local free channel if operate correctly, which can help you save lots of money! Get the free HD Channels like ABC, CBS, NBC, PBC&Fox in 35mile rang from Broadcast Tower, start to access all of the news, sitcomes, kids amd sports programs! ULTRA SLIM DESIGN & EXTRA LONG 10FT COAXIAL CABLE: Sobetter is a Manudacturer with best price for you, this super slim like leaf antenna is one of our design that is lightweight as well. And with extra long 13ft coaxial cable, more flexiable to place at the position with the best reception in your house,the better close to the window and no obstacles between your home and Towers. FULL HD - 35 MILE LONG RANGE ACCESS: At first, please visit "antennaweb.org" or "antennapoint.com" check how many broadcast towers surrounding you within 35miles, Suport Format: 720p, 1080i, 1080p & Frequency Range: VHF 47-230MHz, UHF 470-862MHz. OPERATION CORRECTLY: At first, set up according to the manual, you should make sure you have connected the antenna correctly to HDTV (TV with Digital box). And then put the antenna to a higher location like on the wall, better close to the window and no obstacles between your home and Towers, and keep re-scan channels after moving the antenna. Sometimes moving a few feet can make a difference.